Dhaka, Feb 3 (Just News): BNP Chairperson Begum Khaleda Zia on Saturday said country's lower courts are now under the grip of the government and they do not have the power to deliver proper judgements.
" The Supreme Court said that the lower courts are under the grasp of the government. They can't work independently ....can't deliver proper verdict," the BNP chief said. She was speaking at the inaugural session of the party's national executive committee's daylong meeting that started at Hotel Le Meridian in the morning. "We have seen the consequences of delivering proper judgements. A Chief Justice had to leave the country for delivering the right verdict in Taeique Zia's case," she said. "They are holding the trial to keep BNP out of election. But why they are holding the trial? Where there is no crime how can trial be held? 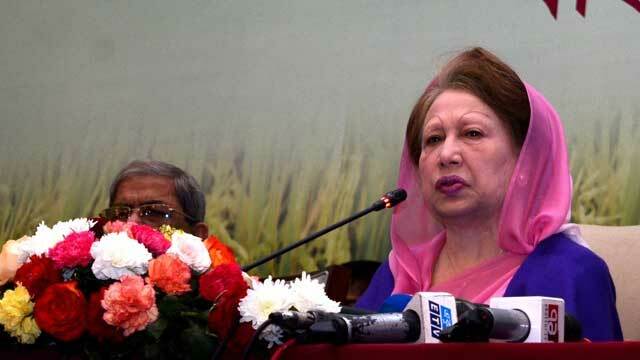 They are doing everything misusing their power," said Khaleda. "We have no fear, but they (AL) are afraid. As per the Prime Minister's announcement the election will be held in December, then why they have started the election campaign so early? They have no confidence," said Khaleda. The inaugural session of the meeting started at 11:05 am where a condolence motion was adopted for the eminent personalities and party activists who have died recently. The BNP leaders and activists observed a one-minute silence to show respect to them. Organisational reports will be placed by the party's Secretary General at this session and the BNP chief is expected to give fresh directives to her party leaders and activists about the party's next course of action and future movement centering the next general election. In the concluding session of the meeting, a closed-door meeting will be held between Khaleda Zia and the party's top leaders. Around 450 leaders, including standing committee members, executive committee members, and vice-chairmen, chairperson's advisers and presidents and secretaries of the party's different associate bodies, attended the meeting.